Today will be a shorter post. We are out of power on the island. Our solar panel failed earlier in the week. We had hoped to have it fixed by now. In fact, we spent much of yesterday trying to fix it. I brought three batteries to for my computer to the island and I’m down to my last one. No video today. This is life on the island, as they say here. Let me introduce you to a new friend of mine. 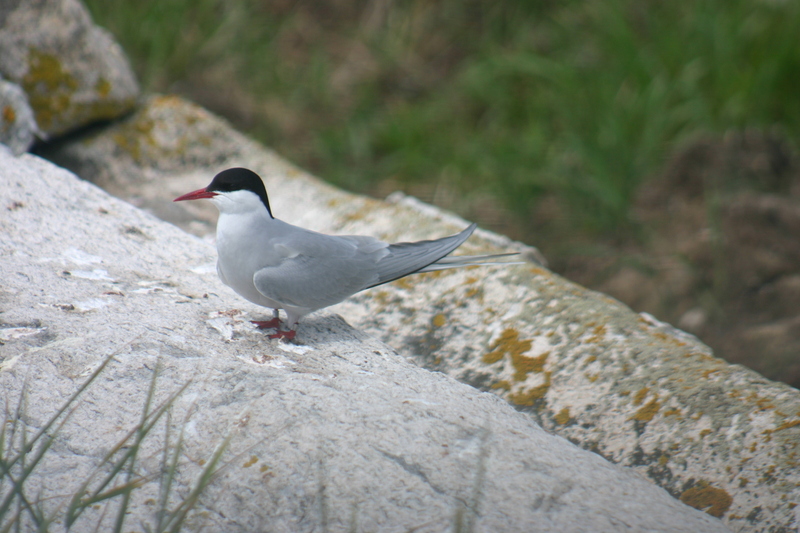 This little arctic tern goes by the name BQ86 on his band. I re sighted him yesterday. When I went to enter his data into the computer, I found that he has an interesting history. He was banded on an island near here in 2001 when he (or she) was just a chick. That means this little bird is 10 years old. Just like many of you in Cottage Lane. This little arctic tern left our area and was sighed here in 2005, 2006, 2008, 2009 and 2010. I sighted the bird yesterday as well. It seems to prefer the top of the island here when it goes to breed. Here is the interesting part. This little guy, like all artic terns, migrates to Antarctica each year in our fall. Each year in our spring, the little bird comes back. Go to Google Earth and find the shortest route to Antarctica. Measure it with the measuring tool on the toolbar. How far is it? How far is it to get there and back? Impressive, right? This little guy has done this 10 times. Yesterday I asked you why you think we might need to monitor all the birds on the island, not just the puffins. Did you figure it out? Ecosystems are all about balance. Each species here on the island has a food supply, a nesting area and behavior pattern. Some nest on the top of the island, some nest near the shore. Some nest in the rocks, some nest on the ground, some nest underground in holes. Some birds eat fish they find in the deep sea. Some birds eat shrimp and smaller creatures from nearer to shore and some will scavenge whatever they can find, including the eggs of other birds. Some eat smaller birds. We found a tern that had been killed by a kind of falcon called a merlin that we have seen flying around here. Human beings interrupt that balance in so many different ways. We have settled along the shore of the mainland, leaving less habitat there for many sea-birds. So more need to nest out here. We have caused changes in the fish population through climate change and through a large fishing industry up and down the coast here. 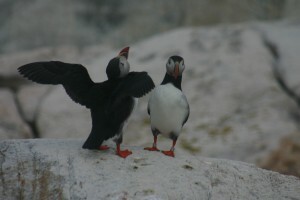 We hunted some species, like puffins, until there were few left here in Maine. Those things cause populations of some species to fall. We also help some species. Gulls are scavengers. They have thrived in our landfills and by eating our table scraps and garbage. There are now far more gulls here than there should be. They are clever scavengers and they will eat the eggs of other birds. If left alone, they would take over the island from the other birds here. The only way the diversity of this island could continue in its natural state is for people to monitor it and help it along. The balance of life on the island must be maintained if it is to continue in its natural state. That’s why we are here. Can you think of other ecosystems that might need help from people in order to continue in the natural state? Write your answers here. 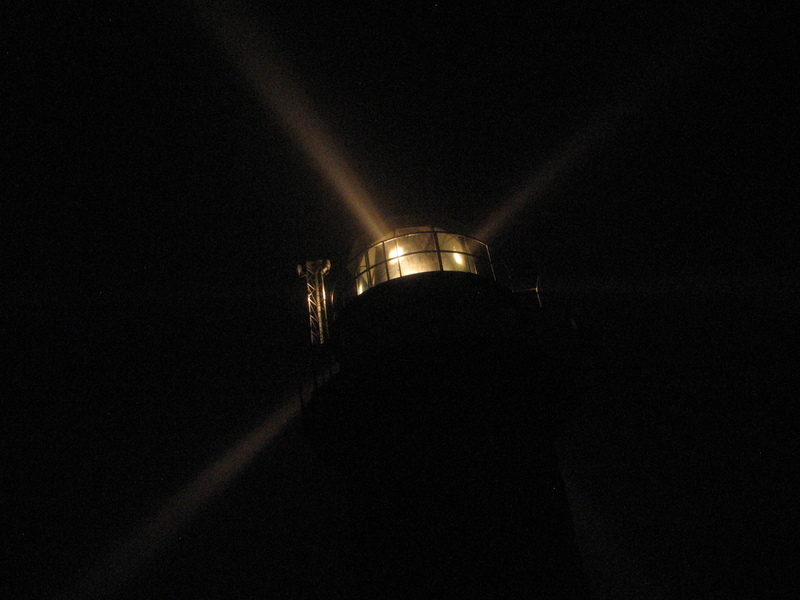 Some of you are asking about the lighthouse. Here is a photo of it at night. The horn is loud, but it does not bother me any more. Hi Mr. Tanenbaum! What a great blog! Fantastic photos and videos. Fascinating information each day. Thank you for bringing us along on your unique and educational adventure! I think the Rainforest is one ecosystem that needs help from people in order to continue in the natural state. Did you go fishing for food? If so what did you use for bait and what did you catch? One ecosystem is in Vermont, there are these moth caterpillars that eat the leaves from trees. No leaves on trees, no food for deer to eat. No food for deer to eat, no deer for predators to eat. At night the light house looks so COOL!!! It must be nice to live in a light house. You must be so lucky to sleep here!!! WOW! That is one cool thing to see how did you get such a good shot? Did you stay out late? Or was that early in the morning? What was the first puffin? The trip to the island must have been a fasciniating sight!